Why do we end up being a zombie in life? That is a question I sometimes ask myself when I finish a lunch or dinner appointment with someone who is struggling with life. He or she is someone who goes through his or her life with a goal and purpose that someone sets for him or her. Often, they do not agree with the goal or a purpose. It can also be said that they get so caught up that goal and purpose is not being reflected upon. The inertia as a zombie is cruel. Well, from what we see in movies that might not be the case! However, for modern day walking zombies, we are normally so chained up in the brain that the idea of doing a 90 degrees pivot is not possible at all. The possibility is not within your programming and not doable. We become zombie when we lose our purpose in life, or can’t see the purpose clearly. 1 year ago, a few of us attended a Finishing Well preview, totally for our benefit which we do not need to provide media exposure. It connects us between what we are doing, what we are capable of, with a goal, purpose we can really identify with. What we found is that, as writers and thinkers, we know these things internally. Yet we have problem piecing all these bits of information together. I totally believe some of us that face challenges will benefit when talking to mentors or counselors who know what is going on, have a way of connecting with us, and help us create a map to bring us greater fulfillment. My friend La Pap has a post up 4 days ago where he was trying to sought out how he should allocate his cash flow from work, to fulfill his financial goals. When you read, you may be connected with what he writes because you might have the same cloudy mind of not having a full picture of how you should proceed forward. It is enlightening as well, if you are a freelancer or a tuition teacher like he is. It is so simple. Its unlike certain bloggers who take idiotic pains to draw out things nicely using a computer. Yet it achieves its purpose. I think you should do this exercise if you can. Here is why. How the hell could I save $50,000 in a single year! 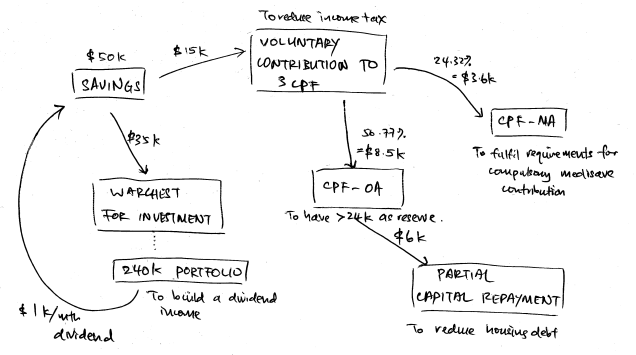 You can contribute voluntary to CPF? Why would any sane person do that! What can I do with my CPF OA, SA or Medisave? So I save so much, how does this help me with my life? You might feel the sudden insecurities how come you do not know how all these things add up. By trying to go through this process, the fear might motivate you to find out more, contact some mentors. The mere exercise of drawing this map out, is that you are taking action. When you take one step, it allows you to take another step. Maps like this may make you disprove certain pre-conceived notion of what you can or cannot achieve with your money. You also develop better understanding when you draw things out on a piece of paper. In research on whether it is better to take notes with paper or computer, it is found that, while taking notes with a computer is definitely faster and neater, those writing things down understand and comprehend better. They push the group of people who separately taken the notes on paper and computer to a test and those who taken the notes on paper scored much better. When you pin the map up, it is a constant reminder of where you could get to. It perhaps create guilt internally when you realize that you are not taking adequate actions to get you to where you want to go financially. To make you see it more, beautify it. Exercise your family and your creative juice! 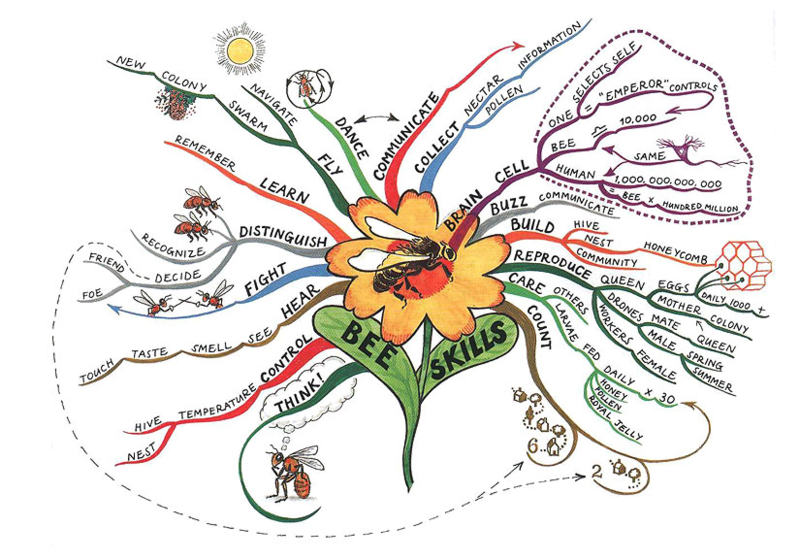 I have always been impressed how some folks can draw great mind maps. I am sure some of you can come up with nice flow charts as well! A wealth map is a form of communication between yourself, or your family. It also act as a conversation starter when people come to your home and see it. Then again, I don’t think you would like it if your friends know how much or little you make and have a conversation about it. To do that, you probably have to be at peace with money. As someone who have come up with so much diagrams for this blog, this well drawn one stuck with me the whole week. If you have not started, perhaps you should. Whether you pin up or not is an entirely different matter. Do it with your spouse or kids. It might aligned the family money wise. Let me know if you have done something similar or whether there are some things that La Pap could improve on. 240K portfolio is to modest. i am sure it’s just mean as something for the compliment to the whole idea of a map. 1 k income for him is sure enough for his HC should be better and better or at least sustainable like Doctors, and some professionals. Unlike us working for some people, we are at the mercy of companies and ROD at 67 or much earlier. Self employed is usually best. hi temperament, it is not always the case. things could change dramatically for him as well, perhaps when the school systems change. for both employed and self employed, the self insurance against unemployment is equally valuable. Something to take note: the numbers on the map is more for illustration purpose. My goal is to save at least 50k a year, but that’s just a number. The plan remains this way. In bad market times, I’ll allocate more to warchest and less to cpf. During good market times, it’ll be the other way. That is the good thing about being self employed as my contribution is not fixed but some arbitrary rule set by others. hi LP, no problem, i think it will be cool to spend $9 bucks printing it out on A2 hahaha! but yes its like taking some family photo out to see when times get challenging. good note on mapping thanks! !